The London Eye is the tallest Ferris Wheel in Europe with a total height of 135 metres. The wheel has 32 ovoid passenger capsules, one for each Borough in London, and each capsule takes up to 25 passengers. The capsules are sealed and provided with air conditioning, seating is available but not compulsory. 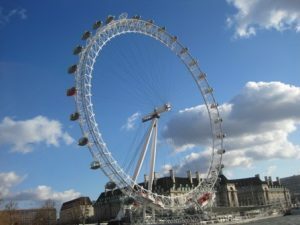 The ride is remarkably steady with the wheel rotating once every 30 minutes and provides exceptional views over London.